With the end of the First World War, the question of minority rights became one of the major topics of discussion at the Paris Peace Conference. Jews and sympathetic gentiles in many European nations signed petitions urging both the extension of minority rights to Jews and support for the creation of a British Mandate for Palestine, a move they hoped would lead to the repatriation of the Jewish people to their ancestral home. 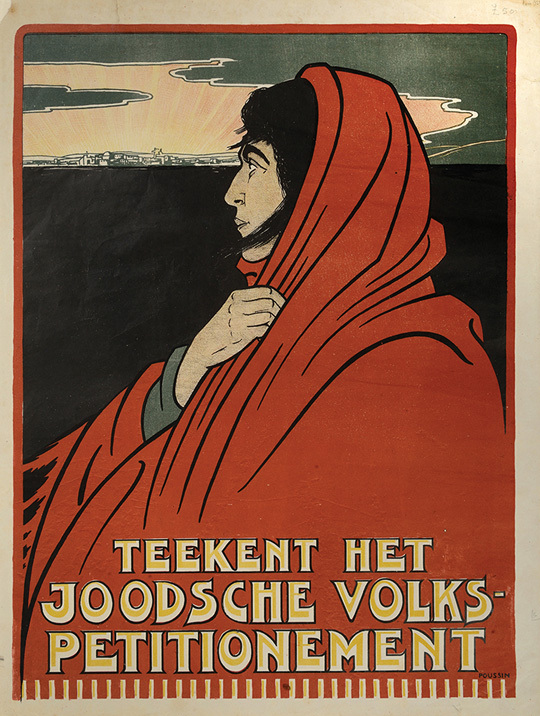 This poster captures that sentiment by depicting a Jewish refugee looking hopefully toward the horizon at a rising sun over Zion. In order to differentiate himself from his father, Albert Hahn, also a well-known artist, Albert Hahn, Jr., utilized a clever multi-lingual bit of wordplay. Since the word haan in Dutch meant rooster, the younger Hahn signed many of his works, including this poster, with the name Poussin, the French word for chick.